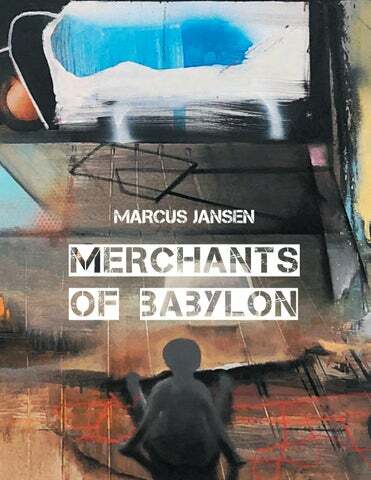 THE DEFIANT ART OF MARCUS JANSEN BY ELISA TURNER Paintings by widely exhibited artist Marcus Jansen simmer with dread. Apocalyptic chaos looms. He punctuates his compositions with streaks of jittery lines, echoing spray-painted graffiti on countless urban canyons and in-your-face street art. They are deliberate disrupters in paintings that refuse to be polite and pretty. These are paintings to challenge the mind and eye. Alluding to the Bible’s Book of Revelation, the title of this exhibit, “Merchants of Babylon,” prepares us for defiant art layered with timely social and political protest. The title evokes an ancient era when powerful leaders used their position to enrich themselves. It’s a narrative in sync with current headlines. To convey a sense of dread, Jansen portrays landscapes as bleak, unstable zones, scarred by shifting spatial perspectives. Such is the case with Grand Chessboard. Much of the canvas is an atmospheric abstraction in dreary tones. It dwarfs a barely perceptible eagle guarding a three-dimensional chessboard near the painting’s lower edge. On this board, tiny, shadowy human figures pursue lonely paths. They vividly convey a lost sense of direction and purpose, of human agency eclipsed. Jansen demands we attend their plight by skillfully depicting an absurd exercise in gamesmanship. Amplifying that foreboding aura, in this painting and others, circles evoking targets and bullet holes randomly appear. Erroneous mathematical equations, like 8+8=13, aimlessly hover. They slyly suggest “fake news” and accusations thereof. Jansen came to the art world with a distinctive history. Born in 1968 in Manhattan to a Jamaican mother and German father, he spent his early years in the Bronx. The era’s spray-painted graffiti on subway trains surely made an indelible impression. From the late 1970s to the late 1980s, he lived in Germany, exposed to his father’s passion for politics, world history, and current events. A brief stint of formal art training was followed by work as a commercial house painter. Witnessing brutal events of Desert Storm and other conflicts as a U.S. Army soldier, Jansen later underwent art therapy at Walter Reed Hospital, receiving an honorable discharge in 1997. Around 2000, he was drawn to creativity percolating in downtown Manhattan, possibly inspired by the well-known Bowery Graffiti Wall on East Houston Street, first painted by Keith Haring in 1982. Clearly the emotional and physical wages of war, along with the rebellious spirit of graffiti art, inform his prolific, defiant career as an artist. BIOGRAPHY Marcus Jansen was born 1968 in Manhattan, New York, resided with his family in the South Bronx and later, Laurelton, Queens where he started school. His family later moved to Mönchengladbach, Germany, where he received a German education and grew up bilingual. Jansen’s unique artistic vocabulary was discovered by the former Museum Director of the American Vanguard Exhibitions Europe 1961, Jerome A. Donson; who wrote about Jansen’s work as being “reminiscent of the Ash-Can School,” and named him the “innovator of modern expressionism.” While showing in Munich, the home of the German Expressionist painters’ movement, Jansen, was noted as “one of the most important American painters of his generation” by the only two-time Documenta Kassel Curator and German Art Historian, Prof. Dr. Manfred Schneckenburger. Inspired by the rebellious art form of graffiti from his native Bronx and Manhattan in the early 1970’s and later again in the early 1980’s on his return visits when he met some of the city’s second generation graffiti art pioneers, the movement became a catalyst for Jansen in the 1990’s, advancing a new generation into socially charged urban landscape paintings. Jansen was influenced by the two very different worlds he grew up in and it’s this contrast that helped mold him into one of a handful of international leading combatants of the avant-garde. 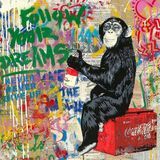 His paintings are often situated between contemporary and street or graffiti art elements that explore and document the human condition critically, socially and politically. Jansen’s public collections include the Moscow Museum of Modern Art, The New Britain Museum of American Art, The PERMM Museum of Contemporary Art, The Kemper Museum of Contemporary Art, The National Taiwan Museum of Fine Art, the Housatonic Museum of Art and the Smithsonian Institution in Washington DC. His documentary film is titled, “Marcus Jansen Examine and Report” filmed by Emmy award winning filmmaker John Scholar. The next upcoming Jansen museum exhibition will be held at the Cornell Fine Arts Museum in Florida in 2020 and is planned to travel to other institutions in the United States. The work explores a birds eye view of three dimensional lanscape painting using various objects and mixed media on wood initiated by Jansenâ&#x20AC;&#x2122;s experience in his first Gulf War conflict in 1990 as he flew over front line areas via helicopter. This sparked interest in an ongoing series that has expaneded since 2009, where Jansen explores the increasing surveillance state, while switching from frontal two dimensional landscapes to gestural three dimensional aerial views. ARTIST STATEMENT Fundamentally my work has psychologically examined some main underlying subjects; power, freedom and warfare on the human condition, three conflicting paradoxes. I use freedom to express visually and respond to observations that have directly affected myself and/or mankind in this century. I’m interested in what drives both elements and investigate through a concentrated reality that I achieve from using an instinctive painting approach, much like the Abstract Expressionist painters; only I include an objective subject matter and ride lines between abstract and realism for a surreal like world. My work investigates different underlying warfare elements that impact much of today’s society and I =continue to center my work around today’s realities, economics and global discourse often politically and socially charged criticism. I’m not interested in ‘pretty’ paintings or paintings of aesthetic value. I’m interested in the soul and character of today’s contemporary realities. Some elements include the toll of economic, class, psychological and military warfare. WORKS ON PAPER Jansenâ&#x20AC;&#x2122;s works on paper have, in large part, been the initial experiments that often prerequisite larger canvas studies. These works in particular explore the freedom of his instinct and brush usage using typical and traditional Abstract Expressionist techniques, keeping the work more gestural and ambiguous. His narrative, if any, is born out of the abstraction itself rather than any preconceived notions. Marcus Jansen DECADE, published by Skira Editore, Milan, Italy. Foreword by Steve Lazarides and essay by Art Historian Brooke Lynn McGowan Ph.D.
Modern Urban-Expressionism, the Art of Marcus Antonius Jansen, published by American Art Gallery, Paris, France. Foreword by Art Historian, Jerome A. Donson, Director of the American Vanguard Exhibitions 1961, MOMA New York. ACKNOWLEDGEMENTS I am deeply grateful to everyone who participated in making this exhibition a reality, especially Marcus Jansen. Special thanks to Wissam Elghoul, Victor Llaguno, Melissa Tye and Mary Ellen Cooper. The design of this catalog would not have been possible without the creative spirit, dedication and patience of Alexis Serrins and late night cover design by Lazlo Hagmasi. The fortitude shown by John Kirkendall during the installation of this exhibition deserves special recognition. Also a thank you to the South West Florida Community Foundation in Fort Myers and the Marcus Jansen Foundation Fund at www.marcusjansenfoundation.org. Let’s make a difference. April 25 - May 25, 2019 at New River Fine Art Marcus Jansen’s socially critical paintings and installations have been exhibited in museums internationally and now will be in South Florida during a selling exhibition at New River Fine Art. Rooted in the New York Graffiti scene and Expressionism Jansen's art speaks of a world in turmoil with isolation, threat, war, surveillance and greed in competition with innocence, hope and humanity. For more information, visit www.newriverfineart.com.